JM Bullion is an online bullion dealer with their corporate headquarters and contact center located in Dallas, Texas. The company buys and sells precious metals in the form of bars and collectible coins. They also offer precious metal IRA facilitation services to customers. The company was founded in 2011 and had 37 employees as of 2016. With 2015 revenue of $661.3 million, they made the 2016 Inc. 5000 list ranking at 40. JM Bullion is a United States-based company that specializes in the physical sale of bullion and coins. Products include gold, silver, copper and platinum. Check out our picks for the best Gold IRA companies by clicking the link below. JM Bullion is a United States-based company that specializes in the physical sale of bullion and coins. They do not provide on-paper-only transactions where the customer or their representative does not take physical delivery of the product. JM Bullion does not provide storage for any precious metals for customers. However, they do recommend a specific vault company for those who do not wish to store purchases themselves or must use a vault service for precious metals IRA deposits. JM Bullion is a dealer that purchases precious metals from open markets on behalf of their clients. They deal in gold, silver, platinum and copper. Precious metals are available in a variety of bars and coins from private and government producers. They also deal with a select set of silver statues. JM Bullion also offers clients the ability to sell their precious metals. 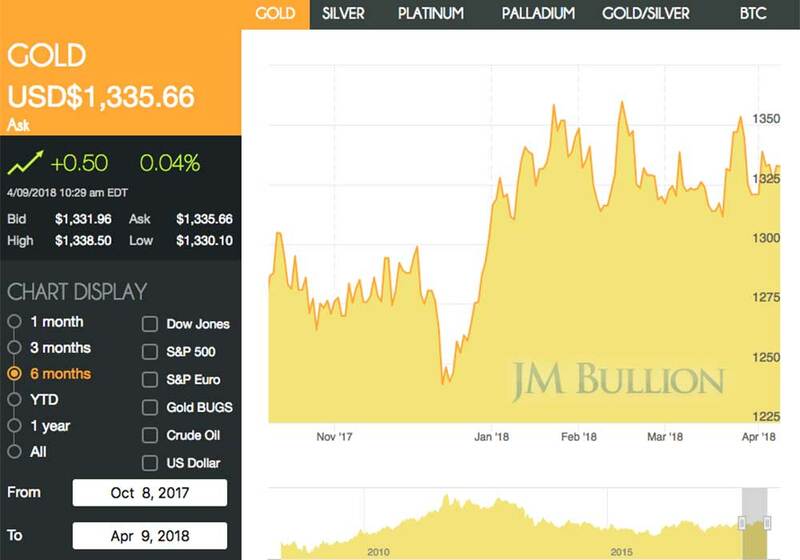 JM Bullion partners with New Direction IRA, a company that acts as a facilitator to correctly set up precious metals IRAs for JM Bullion customers. New Direction IRA fees are separate from and not controlled by JM Bullion. Only certain gold, silver, and platinum products qualify for holding in precious metals IRAs. JM Bullion breaks out the eligible products to make them easy for the potential investor to identify. JM Bullion has low minimum buying limits that allow almost everyone to own precious metals. JM Bullion has a $100 minimum purchase for transactions by credit card, debit card, PayPal, paper checks, and for bitcoin purchases. Bank wire transactions have a minimum of $2,500. There are maximum purchase limits as well. Bitcoin has the highest threshold at $250,000. Bank wire purchases can be made up to $150,000. Paper checks are accepted up to $50,000, and $10,000 is the most you can spend with PayPal. The lowest maximum is for credit and debit card purchases, set at $5,000. Any order over $150,000 must be completed over the phone instead of via the online ordering system unless you are paying with bitcoin. A phone purchase locks in prices and entails making arrangements for payment. JM Bullion does not report every purchase of precious metals to the IRS or other branches of government. However, it does comply with laws requiring the reporting of precious metals sales and purchases when applicable. Most reporting regulations revolve around the amount of the investment and the type of payment used. JM Bullion files both IRS Form 1099-B and IRS Form 8300 when required. Form 1099-B is used to report profits made by non-corporate precious metals sellers. Form 8300 is used to report some sales of dealer customers and cash payments of more than $10,000 in a single transaction. Multiple purchases in a single day may be considered one transaction under related transaction rules. Because JM Bullion does not store any precious metal purchases for their clients, all orders must be shipped either to the purchaser or the purchaser’s agent, such as a vault storage facility. For customers who do not want to store holdings themselves, JM Bullion partners with a vault storage company that clients may contract with for an efficient drop shipment to storage. JM Bullion ships most orders via the United States Postal Service and by UPS. However, some orders may require special arrangements. All purchases include basic shipping and insurance. You can buy upgrades to these services as indicated in the chart below. Perks vary with upgrade level. Precious metals from JM Bullion are wrapped in protective materials and then packed in shipping containers along with packing material to prevent shifting during transit. Because of the valuable nature of the shipments, JM Bullion uses a discrete outer packaging with no hint as to the contents of the packages. Keep in mind that insurance coverage ends upon package delivery. Clients should be aware of when packages will arrive and make arrangements to collect boxes so that they are not left unattended on steps or porches by the shipping carrier. JM Bullion is currently accredited with the Better Business Bureau and holds an A+ rating. Customer reviews are 98% positive with over 1,700 reviews. Many customers discuss positive experiences through multiple transactions. All complaints closed through the BBB in the last three years revolved mostly around shipping issues or customers who attempted to use unverifiable funds for purchases. A few complaints resulted from confusion regarding metals weight and the differences between troy ounces and standard ounces. JM Bullion resolved the claims at their cost even when they were not at fault. Does JM Bullion report my purchases to the government? JM Bullion complies with reporting requirement laws and reports purchases when required by law. They do not report sales or purchases when not required by law. Do I have to pay sales tax on precious metals purchases? JM Bullion does not collect sales tax in any state. However, you may still be required to self-report and pay sales tax on purchases depending on your state’s laws. Check with your state’s revenue department to see if your state requires self-reporting and payment of sales tax on bullion purchases. Can JM Bullion store my precious metals for me? No, JM Bullion does not store any client metals themselves. However, they have partnered with Transcontinental Depository Services Vaults (TDS Vaults). If customers contract with TDS Vaults for storage, JM Bullion can directly ship purchases to the vault account. Clients pay separate fees for TDS Vault services. Can I pay for precious metals with cryptocurrency? Yes, JM Bullion currently accepts bitcoin payments up to $250,000 per transaction. Purchases with bitcoin over that amount will need to be arranged by phone rather than completed online. They do not accept any other cryptocurrency at this time. Ounces are a weight measure for dry goods such as flour, and the technical term for ounces is Avoirdupois, which refers to the weight of goods. Troy ounces are named for Troyes, France and are slightly heavier than standard, or Avoirdupois ounces. Troy ounces are used to measure the weight of metals, gemstones and pharmaceuticals. An ounce of salt is lighter than an ounce of gold because of the difference between the two measurements. Also, troy pounds only contain 12 troy ounces instead of 16 ounces like an Avoirdupois pound. Beyond the confusion in comparisons, it is important to remember that almost all household and kitchen scales use the Avoirdupois standard. If you weigh your precious metals at home, it will not be the equivalent of what you purchased. What types of bullion does JM Bullion sell? JM Bullion sells various types of bullion, primarily as coins, bars, rounds, and bullets. The bullets are modeled after ammunition but are not suitable for firearm use. Gun enthusiasts and historians are among those who collect this type of bullion. Coins carry a higher value since they are genuine, government mint-produced legal tender. Private mints produce both rounds and bars. Rounds are not currency, and therefore have a lower premium associated with them. Precious metal bars have a lower value as well. While many swear by precious metal mining stocks instead of physical holdings in the metals, others feel that having physical control of precious metals provides a fail-safe in case of market collapse. For those interested in having physical holdings of precious metals, rather than investing in a precious metals company stock or a mutual fund, JM Bullion makes the process simple. Their partnership with a vault company and with a precious metals IRA company add convenient options to those interested in adding precious metals to their investments. These options simplify the security of purchased precious metals for clients who are concerned about theft of the physical product from their home, or whose local banks cannot store precious metals in quantity. However, it is vital to take time to understand tax and reporting rules no matter what form of precious metals you invest in to avoid breaking regulations and incurring tax penalties.